Clinically proven to support cardiovascular health. Helps maintain healthy cholesterol levels that are already within the normal range. Mild citrus flavor—no fishy aftertaste. One of the most clinically studied fish oils. Contains the highest concentration of Omega-3 naturally obtainable from fish oil. The naturally-stable fish oil in this supplement supplies the best EPA and DHA ratio. It is the most clinically-studied fish oil available and has been proven to support cardiovascular health. One teaspoon (5 mL) daily with food. Refrigerate after opeining. mixed tocopherols (antioxidant), natural lime flavor, natural rosemary flavor, soy lecithin, and ascorbyl palmitate (antioxidant). sugar, salt, yeast, wheat, gluten, corn, dairy products, artificial coloring or artificial flavoring. This product contains natural ingredients; color variations are normal. 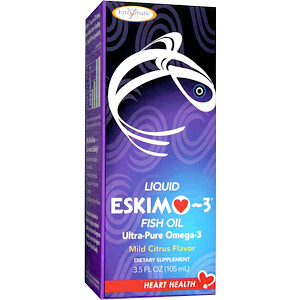 Liquid Eskimo-3 contains fish oil, which is a food source that may be utilized when following a kosher diet. It does not contain ingredients from crustaceans, which are NOT permitted in kosher diets. This product is also in a bovine source gelatin capsule. Because the cattle were slaughtered according to Jewish law (shechitah), the gelatin is kosher. Therefore, the Liquid Eskimo-3 is considered kosher. How much cold-water fish would I have to eat to get the amount of Omega-3 fatty acids in Liquid Eskimo-3? You would need 2-4 servings of salmon or trout per week, or 9-18 servings of halibut, cod, and/or tuna to meet the suggested minimum intake of essential fatty acids. Kosher is a term used to describe food that has been prepared according to Jewish dietary laws, meaning the food is ritually correct or pure. Kosher certification by a manufacturer mandates that the processing of food items is supervised by a rabbi and procedures follow certification standards. Liquid Eskimo-3 has been certified Kosher by Rabbi Meir Horden of the Jewish Community of Stockholm, Sweden. What type of fish are used in Liquid Eskimo-3? How are they harvested? Enzymatic Therapy is committed to the sustainability of the planet's resources. Liquid Eskimo-3 is obtained only from non-endangered species of cold-water fish (herring fishes, including anchovies and sardines) harvested from areas not subjected to over-fishing. Not only are fishing times limited to certain days and certain seasons dictated by federal authorities, but the fish population is closely monitored on a continuous basis. During open fishing seasons, official quotas are established and each fishing vessel is audited. Each vessel must be registered and equipped with a GPS (global positioning system) transmitter to ensure accurate tracking. These measures help ensure that the fish populations stay at sustainable levels. Eskimo 3 Liquid Fish Oil is shipped in a discrete, unmarked package. Orders are processed immediately and usually take about 3 to 5 working days to be received. We do ask that you try it for 2 to 3 weeks to feel the full effects. Any information received is used only for order processing and shipping purposes. Your information, such as e-mail address, will never be disclosed to a third party.